GWL Realty Advisors officially broke ground today on Vancouver Centre II, a 33-storey AAA office tower in downtown Vancouver. The 371,000 square foot building will be constructed at 753 Seymour Street in the heart of downtown Vancouver’s burgeoning tech hub. GWL Realty Advisors is developing the project on behalf of the project owners: The Healthcare of Ontario Pension Plan, the Great-West Life Real Estate Fund, and London Life Real Estate Fund. Vancouver Centre II is the first major project to commence construction in downtown Vancouver’s next cycle of commercial office development and is launching amid heightened demand for office space in the downtown core. With these compelling conditions at play, GWL Realty Advisors is proceeding with construction on a speculative basis. The building is slated to open in summer 2021. 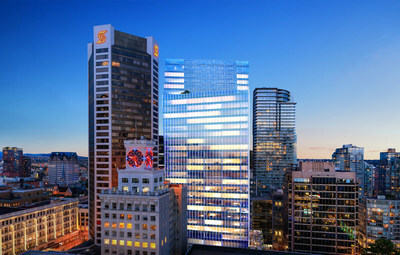 Vancouver Centre II is the next phase of the Vancouver Centre complex, which includes Scotia Tower (650 West Georgia) and Vancouver Centre Mall. Together, the two Vancouver Centre towers will form one of the city’s most amenity-rich, spacious, and sustainable office developments. 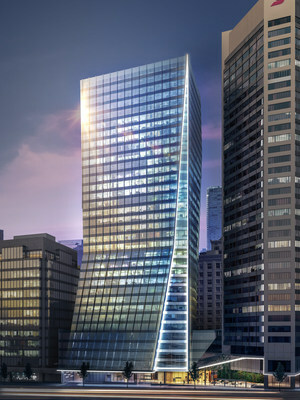 With its central downtown location and its direct, underground connection to two SkyTrain lines, Vancouver Centre II will be the most transit-accessible new-build office tower in the city. The launch of Vancouver Centre II represents the eastward shift of the city’s core business district. The area is quickly becoming the epicentre of Vancouver’s tech community and is already home to several global tech giants. Growing interest in Vancouver as a tech hub is increasing the demand for office space. In its most recent market report (September 2017), Colliers International notes that downtown Vancouver vacancy rates are currently at 5.1 per cent compared with 6.9 per cent at the same point in 2016. Colliers also notes that technology, advertising, media, and information firms now account for 47.8 per cent of all current office space demand in the downtown core. Designed by Musson Cattell Mackey Partnership, Vancouver Centre II’s contemporary architecture is defined by sculptural form and clear glazing. 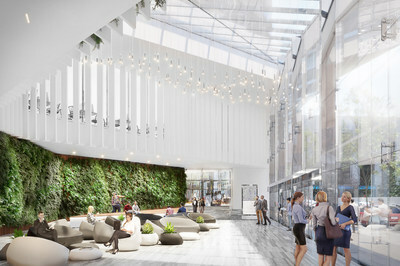 An expansive, light-filled lobby atrium will connect Vancouver Centre II and Scotia Tower. Employees will have access to first-class amenities, including the 29th Floor Skyline Rooftop Deck and a private, state-of-the-art fitness facility and yoga studio with changerooms, showers, and end-of-trip cycling facilities. The building offers open and flexible floor plans that foster creativity and collaboration, and interiors can be tailored to meet each tenant’s specific needs. Vancouver Centre II has been designed for businesses that understand the connection between the workspace environment and the ability to attract top talent. Health and wellness principles that aid in improving the fitness, mood, comfort, and performance of building occupants have been incorporated into the building design and long-term operations of Vancouver Centre II. The project is registered with the International WELL Building Institute™ in its WELL v1 for Core and Shell building rating system and is being designed in accordance with WELL requirements. Building structure, window locations, glazing selection, building proportions, interior finishes, ventilation, and lighting systems will all be considered for their impact on human health and wellness. VCII’s digital infrastructure has been carefully considered to ensure that it addresses the advanced technology needs of today and has the capacity to upgrade to meet evolving requirements in the future. For GWL Realty Advisors, Vancouver Centre II is part of $2 billion in office, industrial, mixed-use, and multi-residential projects that it has planned or underway across Canada. The company has $6 billion in completed, active, and pre-development projects. GWL Realty Advisors is recognized as a Green Star leader and has recently vaulted to the number one ranking in Canada and the top eight per cent globally among real estate management firms by the Global Real Estate Sustainability Benchmark (GRESB).